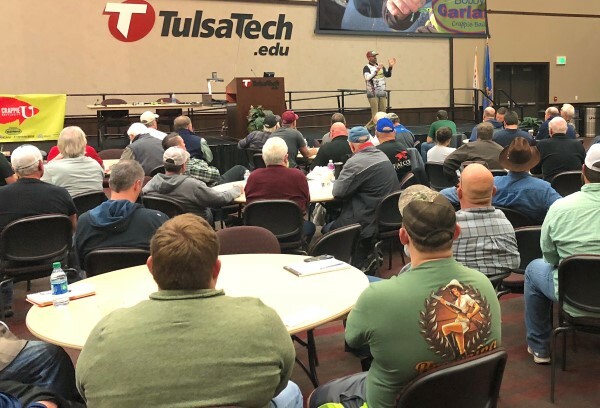 TULSA, Okla. (Jan. 18, 2019) – Crappie University announces its 2019 classes are set and include 10 repeat venues for the new year, all being in areas known for excellent crappie fishing opportunities nearby. In Oklahoma, hosting colleges include Oklahoma’s Rose State College, Feb. 16, in Oklahoma City, and Tulsa Tech Community College – Owasso Campus – on Feb. 23.
including the latest technology just hitting the market. Crappie University classes are hosted at college campuses and consist of eight hours of instruction taught in a classroom setting by expert crappie anglers. The 2019 schedule includes classes in Illinois, Kansas, Kentucky, Louisiana, Missouri and Oklahoma. The instructors are full-time crappie guides, professional anglers and fishing industry experts, and include some of the best-known crappie authorities in the sport, such as “Crappie Coach” Barry Morrow, Kyle Schoenherr, Todd Huckabee, Kevin Rogers, Clyde Folse, Jeff Faulkenbarry, Kris Mann, John Godwin and more. Registration details, including online registration links for several of the 2019 Crappie University classes, are also listed on the same website. Crappie University is presented by Bobby Garland Crappie Baits and sponsored by G3 Boats, Crappie Pro Jigheads, Crappie NOW and Crappie.com.